OkCupid, eHarmony, Tinder—these dating websites and apps continue to offer their online dating service. But when we mean unplugging and meeting somebody using old fashioned ways, what comes to mind is usually turning up the charm when chatting with the Starbucks barista or finally asking your co-worker to dinner. “I get a lot more serious than joke calls, though I do get a lot of joke calls from men. But I also get a lot of calls from men congratulating me saying it’s a great idea,” said Mr. Perino. Over the last 16 days, he’s gone on 39 first dates. Usually, he takes each woman out for a cup of coffee, and, most of the time, they each pay their way. Because printing thousands of posters and treating every potential love interest costs money. But even more so, it takes time. “They take pictures of the flyers and show them to their friends and I get stopped constantly—I’m not bragging, I’m just saying. 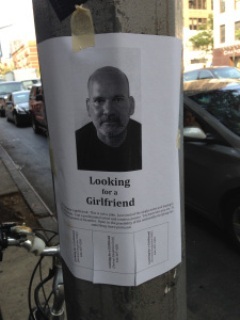 I get stopped a lot and it slows me up from posting flyers. It’s kind of enjoyable, but it’s hard to accomplish my flyer duties for the day,” lamented Mr. Perino. Okay, so say Mr. Perino’s ploy is the final frontier of dating. What kind of women are responding to an ad on a poster? “With a couple of exceptions, all of them have been younger. I’m interested in women in their 20s and 30s. I want to keep the option for marriage and possibly another child so I’m not going to have that if I find a woman my age. But I really am thinking about marriage and a child. Just one,” he said. Though Mr. Perino emphasizes that he’s into doing things the traditional way—one-night stands need not apply, he added that his poster campaign switches up conventional gender roles. “I turned the tables on the women. Women have to call me and I no longer have to be the hunter,” Mr. Perino declared.